Our very own Client Services Team! 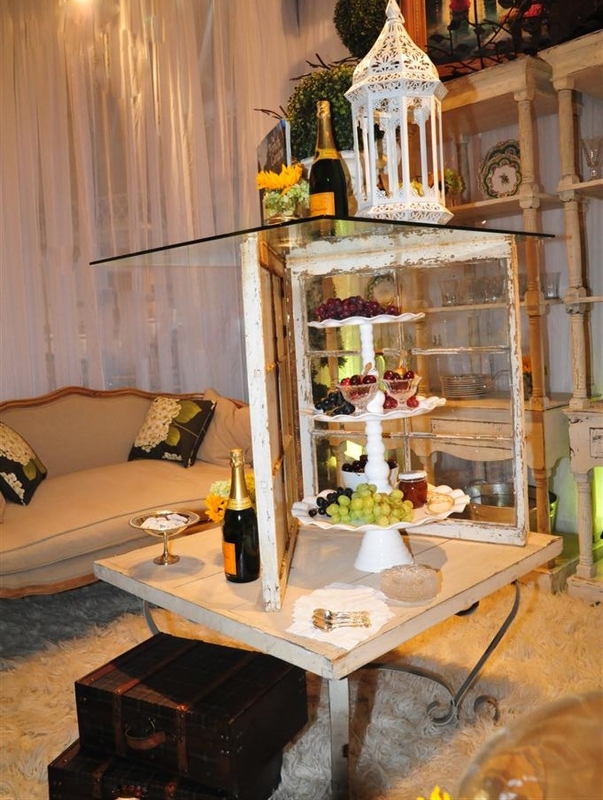 With all the "playing house" as we call designing tables in the showroom, you, our clients, taught this team well. 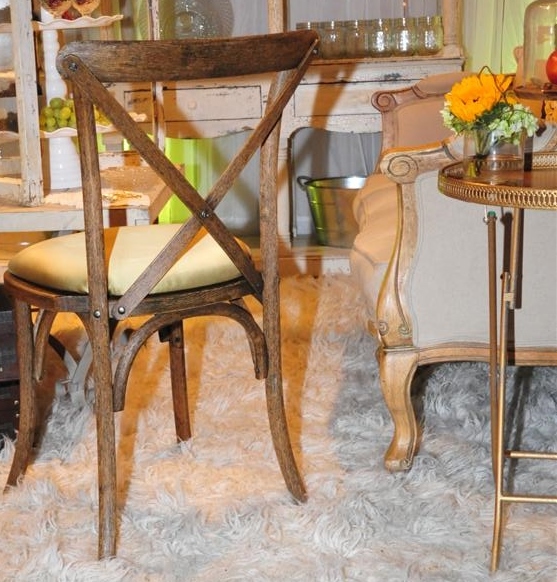 They wanted to do "something never before shown" for our Guest Designer Table (GDT). Long-time veterans, Maria and Zoila (who lays out our GDT eblast each month) started by reviewing all 16 of our previous Guest Designer Tables (and you can too on our website Guest Designer Table). They decided to put together a lounge grouping appropriate for late night nibbles. The first piece of furniture they chose was our Vintage French Etagere. 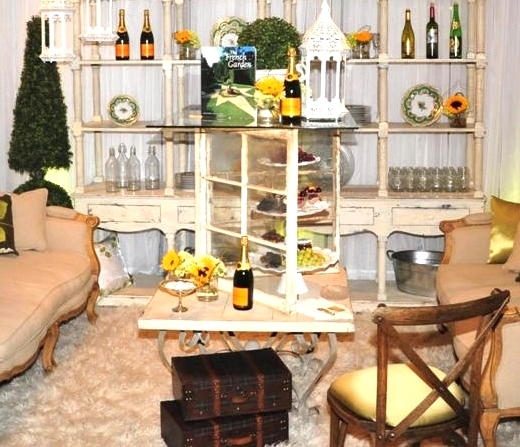 They naturally chose a shelving unit which would allow them to display lots of our products. Betty who is good at telling you about new products when you call, wanted to make sure to include new products in their display, including our brand new Small Galvanized Metal Ice Tub. 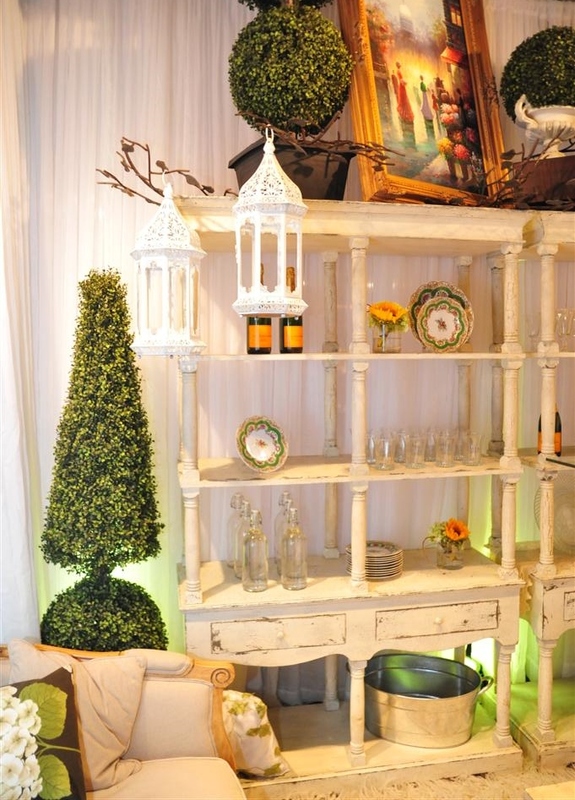 Whether on the back wall of the vignette, on the top of the coffee table or even on the floor where our Vintage Plaid Travel Cases are stacked, the goal was to showcase a wide variety of inventory, all in keeping with the theme, A French Summer Garden. Our newest pillows, Moss Shantung and Green Petal/White Organza were subtly placed with our popular Brown/Green Hydrangea pillow. (Could that have been Vera's recommendation since her sewing hobby was put to very good use when we started our pillow inventory?) 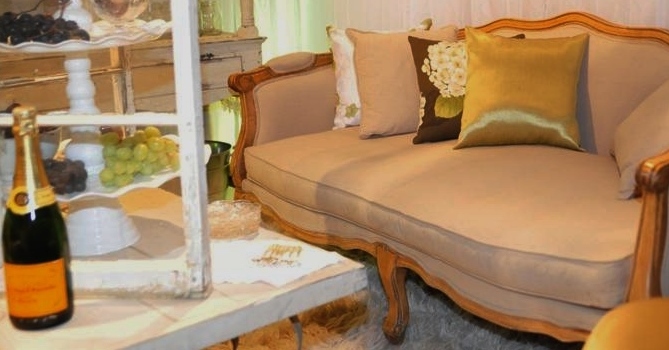 As for the Vintage Country French couch pillow also shown with the collection, the team wants to remind you that those pillows are ordered separately from the couch. But don't worry if you forget. Everyone in this department, knows it is Tablescapes' philosophy to be proactive and review orders for potential missing items. Tables, no chairs? Cups and saucers without teaspoons? These observant individuals are always watching out to make sure you have everything you need. The biggest tip that the team wants to share with you is about order confirmations: Our total price for all pages (no matter how many pages your order is) will always be on the bottom of the first page for a quick summary. Remember on big rental orders, keep scrolling to see more pages. Creating only one look was a big challenge. We have over 2500 items in our inventory and our Client Service team knows every one of them! Our newest team member Lorely admitted being overwhelmed when starting out, but numerous hours in our showroom built her knowledge quickly. For all you visual learners, we hope you consider our website as a personal showroom. 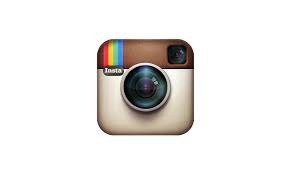 A tip the team gives to clients time and again is to click on the thumbnail of the product. All dimensions and complementary sizes are pictured on the new page. The other challenge in creating this tableau was, that compared to clients who are here creating for only a few hours, they all had the luxury of time to tweak and make changes. Two of the men on the team, Sammy and Ivan, began their Tablescapes' careers in the warehouse with plenty of moving and lifting. Well, that expertise was put to use again so many times as the design took shape. Being located in Creative Corridor (at last count there were over 30 planners, caterers, venues and florists in our neighborhood) was a real advantage when the final iteration of their vignette still needed greenery and complementary details. Derrick Taylor of Derrick Taylor and CO came to the rescue. Because he is such a familiar face and good friend to us all, he got the concept, loaded up his car and was here in 10 minutes to lend his expertise. 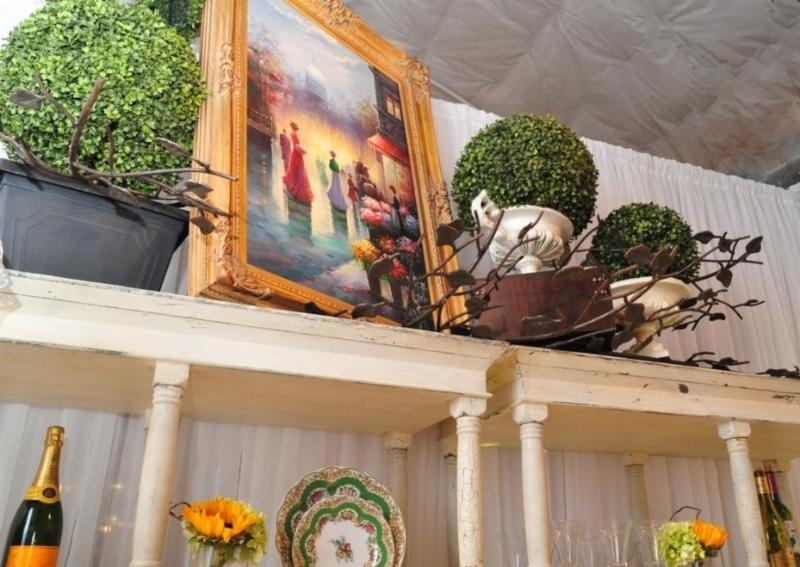 He not only provided the greenery, but the window to frame our White Three-tiered Compotier, a painting and even a book entitled The French Garden! 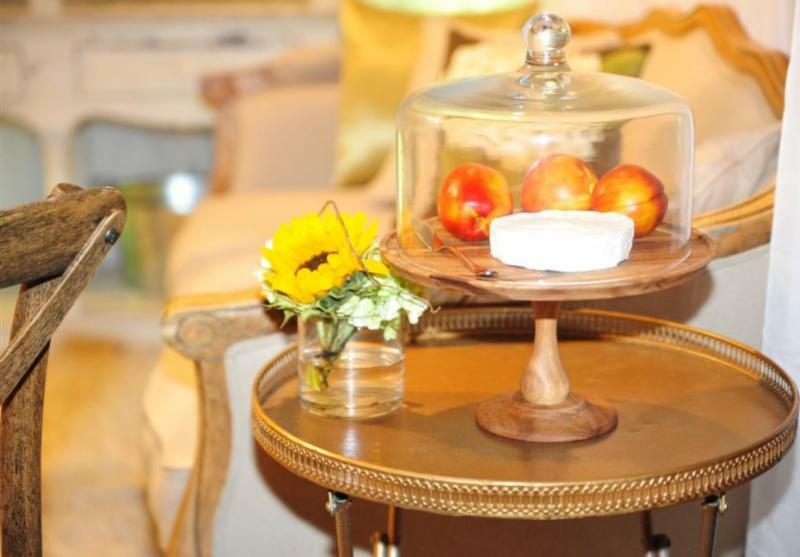 His fresh floral creations accented our new Wood Pedestal Stand that just happens to fit under our Glass Pedestal Cake Dome from the Glass Pedestal Plate Stand. Derrick's unique contribution was using our new Metal Tree branches as branch décor without the Metal Tree trunk. As the newly engaged Erin was arranging the fruits and goodies before photographing, she said "this is exactly how I want my wedding to be." 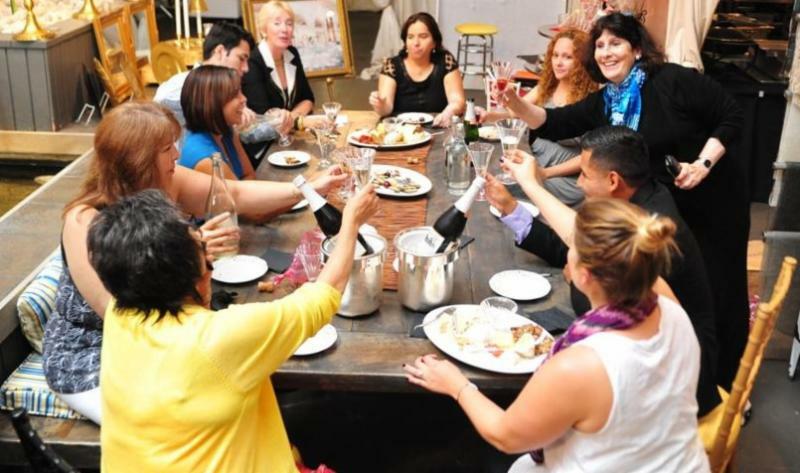 In closing, we want to not only send a huge THANKS to Derrick, but share a picture of just a typical day at Tablescapes. Only kidding. It is more likely, if you look closely at the picture, yes, that is a phone in Rose's hand, and she barely got to toast in between phone calls. 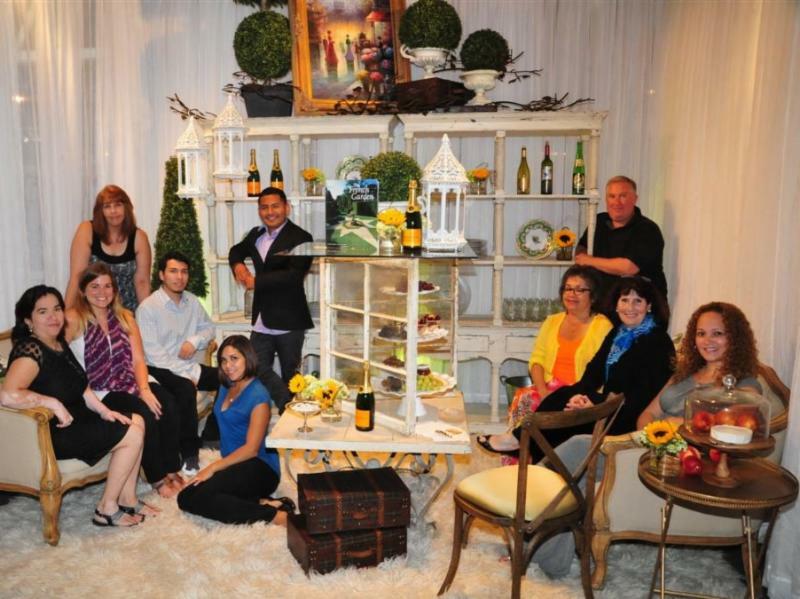 For the Tablescapes Client Services Team, a hectic day is the norm, but they love helping our customers. Please keep those calls and emails coming. They love hearing from you. We're going fishin' for the month of August.